The 5.11 Tactical Vest is a special purpose-built vest made to carry and conceal bulky items and gear, while maintaining a casual appearance. It has been designed with convenience, efficiency and durability in mind. Only the finest components are used in the construction of this extraordinary vest, from the high-density 100% Cotton Tactical Canvas to the Prym snap and YKK zipper. The reinforced stitching at critical seams ensures that the garment will last a lifetime. Sixteen specialized pockets are on the outside and lining of the vest to store vital gear or documents. In addition there is a concealed compartment in between the shell and lining of the vest on each side, inside of which is a removable hook and loop panel for mounting modular holsters or other carrying devices (carrying devices are not included). 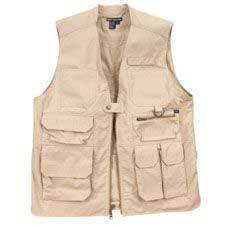 The length of the vest also helps to conceal weapons worn at the waist. Enjoy the features that have made the 5.11 Tactical Vest the number one choice of law enforcement agencies nation-wide.